The suspense and excitement of a treasure hunt, orienteering is an adventurous activity for people of all ages, fitness and skill levels. Participants navigate their way between control points marked on a specially drawn map. The terrain involved can vary and the pace can be decided by the individual. How’s your navigation? Can you find all the landmarks on the map? 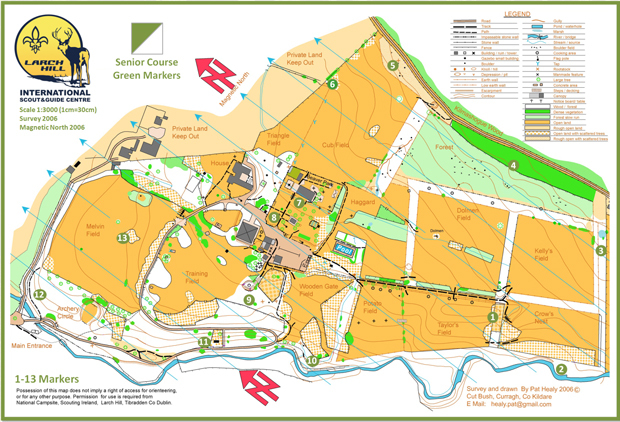 Once you have been taught how to read a map you will need to navigate your way around our 88 acres. Orienteering is ideal to give people of all ages independence, work on their own initiative and using leadership skills. There is a junior course, intermediate course and a senior course. Grid Reference Orienteering is also available to brush up on those map work skills.